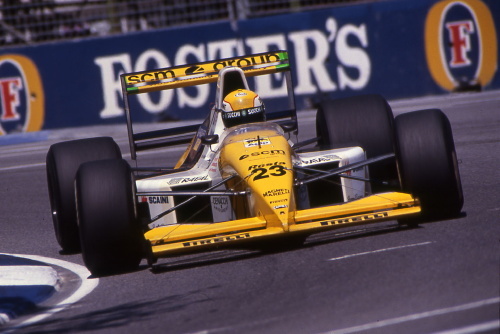 With Luis Perez-Sala having left the sport, Minardi had an all-Italian line up in 1990. Paolo Barilla, who had stood in for Martini for the 1989 Japanese GP, took over as the team's second driver. Minardi once again used a Ford V8 3.5 engine and the sticky Pirelli tyres which gave the Faenza-based squad an edge in qualifying. 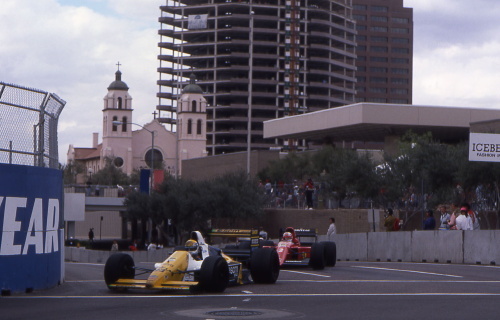 The season couldn't have started any better when Pierluigi Martini put the car on the first row at the United States GP in Phoenix. In spite of qualifying in second place, Martini took no points back home to Faenza, finishing only 7th. What followed was the team struggling with its engine and not scoring a single point all year, in spite of a series of gutsy qualifying performances by Martini. For Barilla, the first full season in F1 turned out to be a tough one, qualifying far behind his teammate all year. This was partly to blame on the fact that the cockpit was too small for him. His best race performance was an 11th spot at Imola. Barilla was replaced by Gianni Morbidelli for the final two races of the season. Keen to ditch the unreliable Ford units, Minardi signed an engine supply contract with Ferrari for 1991, a move which would see the team return to the points.